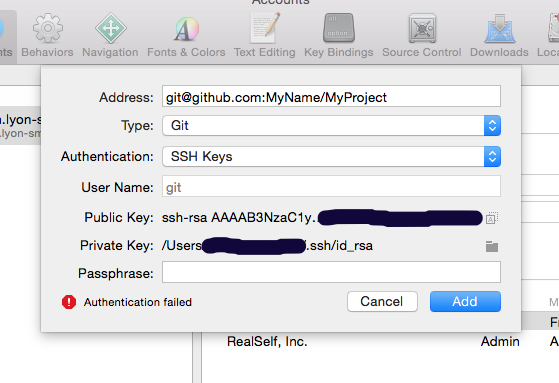 GitHub is working at the command line using this SSH key, why is Xcode 7 not working? After thinking that this was an Xcode 7 bug, because of posts like this one I finally found that the problem was actually caused by GitHub. I generated new SSH keys and uploaded them and my Xcode 7 bots are working fine with SSH. I got a similar problem with getting XCode to authenticate, but with a repository hosted on my synology NAS, running DSM 5.2 which has git-server running. Using XCode 7.1.1 on OSX 10.11 and trying to connect to git with ssh://myUser@192.168.1.220:/volume1/git/myrepository.git results in a dialogbox "Failed to Start SSH session: Unable to exchange encryption keys(-1)". Restart the SSH service and retry accessing git with XCode, and check the log again. Okay, restart the SSH service again, and try again to login with XCode. Now it works. DISCLAIMER: I'm not a Linux expert, so there might be better ways to do this. Also, this lowers the security on your NAS as you are accepting less secure algorithms... but at least it works, and if anyone has better idea's, I'd love to hear it. Not the answer you're looking for? Browse other questions tagged github ssh repository xcode7 bots or ask your own question. In Xcode 4 how do I add a remote GitHub repository to an existing local project?